Brightech Ambience Pro LED Outdoor Lights feature WeatherTite technology, which means we've built the wire with extra protection against nature. Wrapped in a strong rubber casing of premium quality construction, our strands hold up to the harshest elements. They are well insulated so you can leave them out all year long, even during bitter cold winters. Rains will fall and winds will blow, yet these heavy-duty outdoor LED light sockets are strong enough to withstand the wear and tear of outdoor use every year. Conserve energy with these 2-watt LED bulbs (7 in all) made of durable glass to lend a classy restaurant look and feel. (For replacement bulbs please search for B01IQIUYU8 at Amazon.com) The vintage design with charmingly retro exposed filaments provides light bright enough to enjoy al fresco dining after dark, but at 3,000k they're still gentle on the eyes and environment. Tether up to 80 strands together with nothing else needed to connect additional sets as they plug into one another, end to end. Lights may be attached to a dimmer for greater versatility in mood lighting. We recommend the The Lutron TTCL-100H-BL Credenza Dimmer. LUMINOUS DÉCOR FOR ANY OCCASION: Illuminate your patio, deck, garden, porch, gazebo, or pergola in an elegant warm glow to set the mood for an evening of fun and laughter outdoors. These Dimmable heavy duty LED string lights will create the perfect atmosphere for a birthday party, family reunion, evening cocktail party, or wedding reception. For greater mood lighting flexibility and a soft glow, wire the lights to a dimmer switch to enhance the atmosphere for a romantic dinner for two. STRONGEST WEATHERPROOF LED LIGHTS ON THE MARKET: Brightech lights are designed to withstand the wear and tear of year-round outdoor use. They are UL listed, weatherproof, and waterproof built with Brightech's durable WeatherTite Technology so that they can withstand extreme temperatures, rainy, windy, or damp climates. 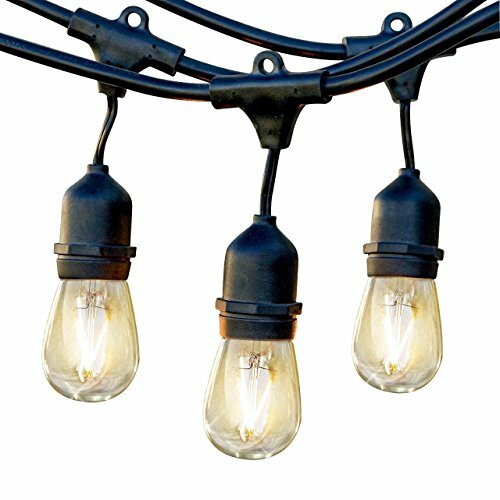 The heavy duty light cord is rubbery, flexible, and thicker than a traditional cord so that you can confidently leave these ultra-durable string lights on display year round. SATISFACTION GUARANTEED WARRANTY: Our goal at Brightech is to provide creative, innovative, and beautiful lighting so that everyone can have quality, high end lighting in their home and office. We proudly stand behind all of our products 100%, which is why we offer a full 3 year warranty. If for any reason you are not satisfied with your purchase, please contact us because our number one goal is customer satisfaction and we are committed to making it right for you.